Some of the most beloved characters in film and television inhabit two-dimensional worlds that spring from the fertile imaginations of talented animators. The movements, characterizations, and settings in the best animated films are as vivid as any live action film, and sometimes seem more alive than life itself. In this case, Hollywood's marketing slogans are fitting; animated stories are frequently magical, leaving memories of happy endings in young and old alike. However, the fantasy lands animators create bear little resemblance to the conditions under which these artists work. Anonymous animators routinely toiled in dark, cramped working environments for long hours and low pay, especially at the emergence of the art form early in the twentieth century. In Drawing the Line, veteran animator Tom Sito chronicles the efforts of generations of working men and women artists who have struggled to create a stable standard of living that is as secure as the worlds their characters inhabit. The former president of America's largest animation union, Sito offers a unique insider's account of animators' struggles with legendary studio kingpins such as Jack Warner and Walt Disney, and their more recent battles with Michael Eisner and other Hollywood players. Based on numerous archival documents, personal interviews, and his own experiences, Sito's history of animation unions is both carefully analytical and deeply personal. 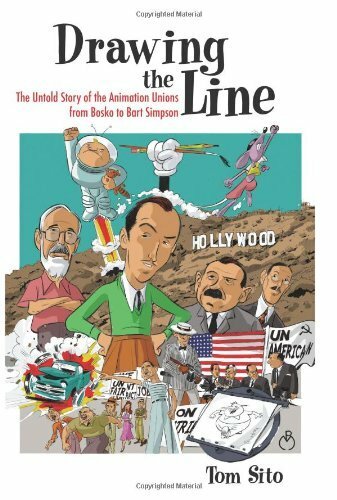 Drawing the Line stands as a vital corrective to this field of Hollywood history and is an important look at the animation industry's past, present, and future. Like most elements of the modern commercial media system, animation is rapidly being changed by the forces of globalization and technological innovation. Yet even as pixels replace pencils and bytes replace paints, the working relationship between employer and employee essentially remains the same. In Drawing the Line, Sito challenges the next wave of animators to heed the lessons of their predecessors by organizing and acting collectively to fight against the enormous pressures of the marketplace for their class interests -- and for the betterment of their art form.